The basketball gods giveth, and the basketball gods taketh away. 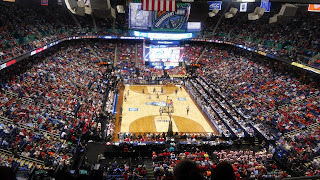 The NCAA basketball rules committees have put forth their proposals for rules changes to men's and women's basketball. With an overarching theme of improving pace of play, some of these changes, if adopted, could have unintentional impact on the pep bands. In the men's game, the proposal pares down the timeouts. There is one fewer team timeout in the second half, and any timeout taken within 30 seconds of a scheduled media timeout would serve as that timeout. Even moreso than halftime, timeouts are the primary currency of pep bands. Word? I like it, even as I acknowledge that for practical application, it may not change too much. Many dead ball situations are after a made basket for just a moment before the ball is put back into play.This really only gives time for a cymbal crash or a short sting, but knowing it's available, pep bands could be creative in their repertoire, having short bits on cue for exactly that. And because those situations are typically short, an always ready band wouldn't have a problem boxing out the PA, whose operator may be hesitant to start the canned music for such a short time. Moreover, I'm pleased that when considering improving the fan experience, the pep bands were one of the things that came to mind.